big brain audio is all about learning audio software and hardware tools and techniques. We specialize in short, intensive training courses where our number one concern is excellent hands-on learning in a uniquely rich environment. In addition, big brain audio is an Ableton Certified Training Center, using Ableton Live not only as the chosen electronic production environment, but also as a powerful sound design and composition tool. 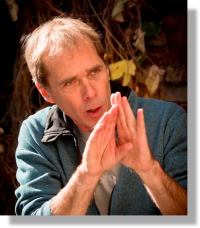 big brain audio was created by Brian Smith, long-time product specialist at Native Instruments and Ableton Certified Trainer. Based in Berlin, Brian been involved with audio technology since the early 1980s and has lectured and taught numerous workshops on synthesis, sampling, sound design, and audio production techniques. He also wrote and hosted the highly-acclaimed NI Absynth and Kontakt Tutorial DVDs along with a number of manuals and online videos. The aim of every big brain audio workshop is to give each participant — regardless of technical knowledge or skills — a huge boost in productivity and creativity. Each workshop takes place in a relaxed, but focused atmosphere where each participant learns to use these powerful tools to bring their musical ideas to life. The environment is open and collaborative, where you’ll learn from the other participants as well as from excellent instructors! Most workshops have a maximum of twelve participants (when they are taught by two instructors). Many of the workshops are team-taught, giving you the insight from two different audio experts. 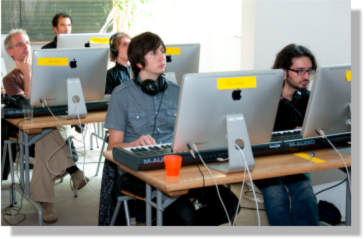 Each participant has his or her own high-end workstation, consisting of high-performance iMac computers and M-Audio Axiom keyboards. In Ableton Live music production workshops, participants also have their own Ableton Push. A flexible wireless network allows for group and individual work to be shared and encourages cooperation and collaboration. Each workstation includes full, current licenses of Ableton Live, NI Komplete 8, Maschine, and Traktor Pro. We teach you how to use the audio tools made by two legendary Berlin-based audio giants: Native Instruments and Ableton. The products of both of these companies has transformed music production and performance over the past fifteen years. Our aim at big brain audio is to give you the skills you need to turbocharge your productivity and creativity. The instructors are also the best: Stephan Schmitt, Brian Clevinger, Mads Lindgren, Mike Daliot, Frank Elting, Cristiano Nicolini, and Eric Müller. Need a specially tailored approach? Brian Smith now offers one-to-one training on Maschine, NI Komplete, and Ableton Live. Whether your interest is production, sound design, or performance contact him today!